Kalua Chicken is a dish inspired by the equally delicious Kalua Pig dish that originates from Hawaii. 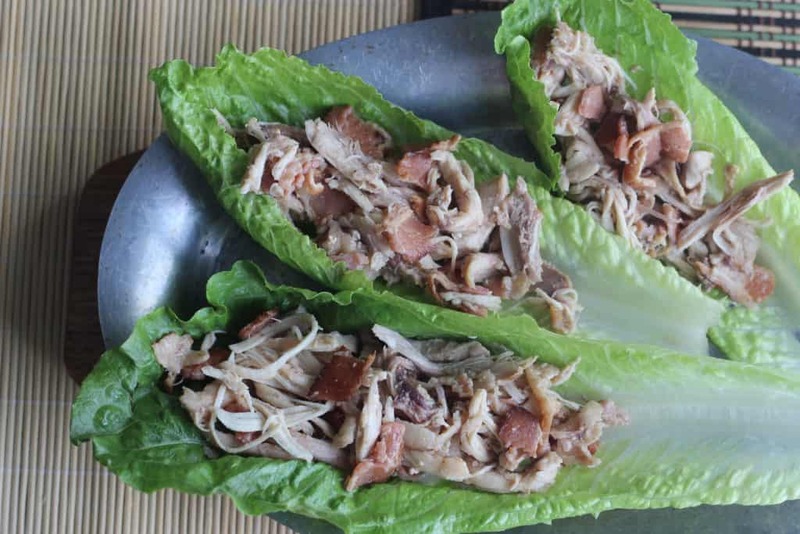 The traditional Kalua pig is a pig wrapped in banana leaves and afterwards set on coals. The pig is then buried underground for hours until a delicious roasted pig is uncovered and then devoured. Check out this cool video of the unveiling of a yummy Kalua Pig at a Luau in Hawaii, these guys certainly seem to know what they’re doing. Believe me, it tastes better than it looks! 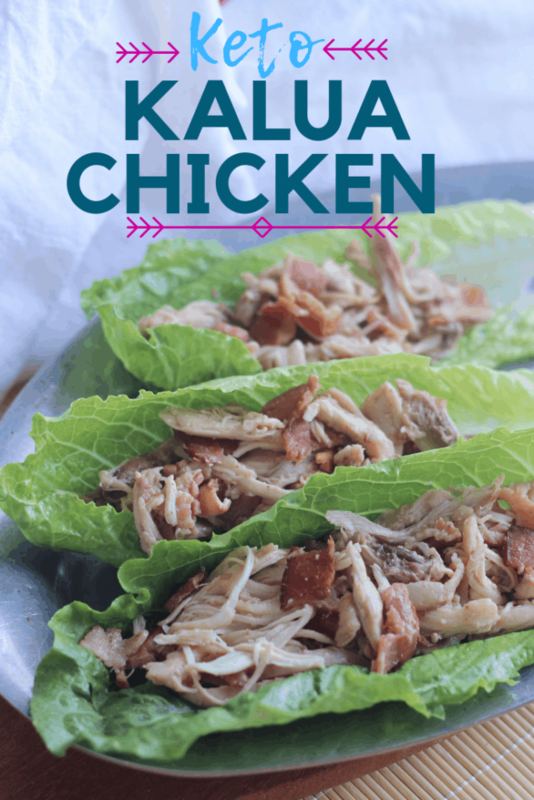 Undoubtedly the key to making this Keto Kalua Chicken in under an hour is a pressure cooker. Due to the versatility found with an Electric Pressure Cooker it is a must have kitchen appliance . As a matter of fact I use a pressure cooker to cook large roasts quickly and evenly. I use mine to cook frozen chicken thighs, still frozen, in under an hour. I also make pot roasts and use it to steam vegetables. I use frozen boneless skinless chicken thighs in this Chicken pressure cooker recipe however using fresh chicken thighs in the pressure cooker will gain the same result. 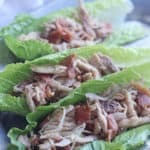 What goes with Keto Kalua Chicken? pair nicely with this Keto Pressure cooker recipe. Keto Kalua Chicken made in under an hour. Feed your family this delicious Chicken inspired by the traditional Hawaiian dish made with your pressure cooker. 1/2 Cup Chicken Broth Check your owners manual and use minimum amount of liquid. With your pressure cooker set to “saute”, fry the bacon for about 5 minutes or until cooked. Meanwhile, sprinkle the sea salt on the frozen chicken thighs. When the bacon is done cooking add the chicken broth, liquid smoke and coconut aminos to the pressure cooker to de glaze and get all the tasty bits of bacon off of the pressure cooker. Be sure to do this quickly and keep your hands clear in case the bacon grease decides to pop up. Add the salted chicken thighs to the pot and turn off the saute setting. Seal the pressure cooker lid according to your instruction manual. Set the pressure cooker to cook for 12 minutes. Allow the pressure to release naturally. 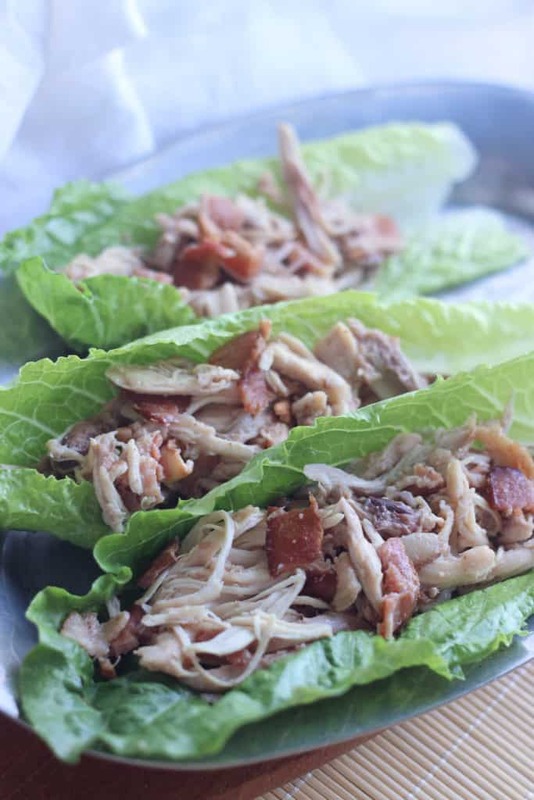 Remove the Chicken and bacon from the pressure cooker and place in a bowl or serving tray. Shred the chicken using the bear claw meat shredders or simply use your electric hand mixer. If the chicken does not shred easily put it back in the pressure cooker and cook for an additional 2-5 minutes and release the pressure manually again. Once the chicken is shredded, pour about 1/4 cup of the liquid from the pressure cooker onto the shredded chicken. This will add back flavor to the dish. Taste the chicken and add more broth if needed. Serve on Romain lettuce as pictured or simply eat it by itself. It was hard for me to not eat the whole bowl before I took a picture guys! Enjoy! 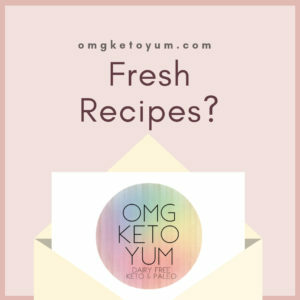 Drop a comment below and let me know what you thought of this delicious and easy keto chicken pressure cooker recipe. Share this keto and paleo recipe on social media and spread the love.